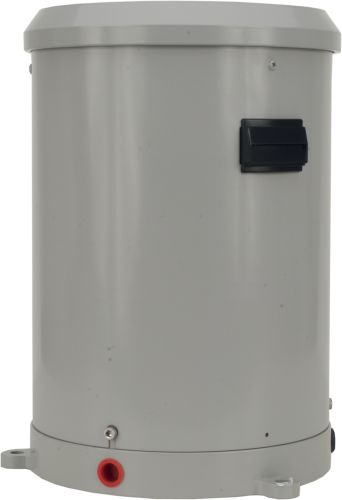 The CS700, manufactured by HS Hyquest Solutions, is a high-end tipping bucket rain gage with an 8 in. orifice and a heavy-duty cast aluminum base. It measures precipitation in 0.01 in. increments. The CS700 is ideal for locations where intense rainfall events may occur. This tipping bucket is compatible with all Campbell Scientific data loggers and is used in environmental monitoring applications. The CS700 funnels precipitation into a bucket mechanism that tips when filled to its calibrated level. Each tip is marked by a dual reed switch closure that is recorded by a data logger pulse count channel. After measurement, the water drains through two orifices (accepts 12 mm tubing) in the base, allowing the measured water to be collected in a separate container. The CS700 contains an internal siphon mechanism that causes rain to flow at a steady rate to the tipping bucket mechanism (regardless of intensity). The siphon allows the sensor to make accurate measurements over a range of 0 to 50 cm per hour. Each tip of the CS700 is marked by a dual reed switch closure that is recorded by a data logger pulse count channel. What is the output range of the CS700-L or the CS700H-L? These rain gages don’t necessarily generate a voltage range, but rather a pulse. Depending on how the rain gage is connected to the data logger, the gage can generate a sourcing current or a sinking current pulse. Is it possible to regulate the distance within the base of the CM240 to get it to fit with the holes of the TB4-L? The CM240 fits the CS700-L, TB4-L, and the retired 385-L rain gages. Is the CS700-L, CS700H-L, or 52202-L connected to a control input or a pulse channel? These rain gages can be connected to either. When a control port is used, one lead goes to the 5 V port to provide current, and the other lead goes to a control port to detect the current. When a pulse channel is used, one lead goes to the pulse port, and the other lead terminates on a ground terminal.